• July 27, 2018. The Foundation for Applied Molecular Evolution, with support from the John Templeton Foundation, will hold an unusual conference on the Origins of Life from October 14 to 17, 2018. It will feature dialogs to resolve remaining paradoxes in models for life's origins. Dialog participants will come from around the world to advance the science, and include leading chemists, geologists, and biologists in the field. Please visit the conference website for more information and to register for this event. • January 30, 2018. 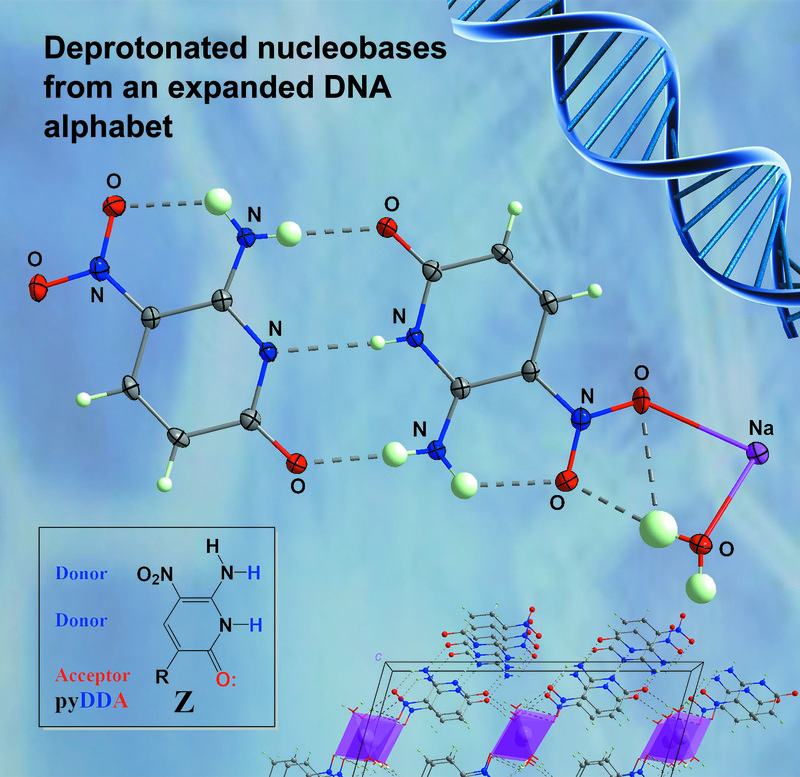 DNA Script, a French company devoted to enzyme-based DNA synthesis, announced today the licensing of nucleic acid innovations created at the FfAME to support large scale inexpensive DNA synthesis. • January 18, 2018. Steven Benner, Distinguished Fellow at the FfAME, will discuss alternative approaches to financing research seeking to understand the origins of life. The discussion will be held in the evening at the Gordon Research Conference on "origins" in Galveston, Texas. He will discuss philanthropic support, including from the John Templeton, Simons, and private foundations, as well as spinning off discoveries in this basic research field into diagnostics and medicine. More information can be found here. • December 16, 2017. Steven Benner, Distinguished Fellow and Director of the FfAME, will deliver the 2017 Commencement Address at Ashland University, on December 16. With an "accent on the individual", Ashland University is a private university that shapes graduates who work, serve and lead with integrity in their communities. Ashland is known for supporting free, open and critical inquiry for both students and faculty necessary for intellectual and professional development. • December 6, 2017. On December 6, Steven Benner will engage in a public conversation on the topic "What is life?" on the stage of Caveat, 21 A Clinton Street, Manhattan, New York. There, he will be joined by the noted science journalist Carl Zimmer, following discussion with Jeremy England, the physicist from MIT. Zimmer is a columnist for The New York Times, where his column "Matter" appears each week. In 2016, Zimmer won the Stephen Jay Gould Prize, awarded annually by the Society for the Study of Evolution to recognize individuals whose sustained efforts have advanced public understanding of evolutionary science. This program is a collaboration between The Story Collider and Caveat, and is supported by Science Sandbox, a Simons Foundation initiative dedicated to engaging everyone with the process of science. Doors open at 6:30 PM, with a discussion beginning at seven. Tickets are $20. More information can be found here. • November 22, 2017. Steven Benner was awarded on November 15 the BBRC Prize for his work creating artificial Darwinian systems. He received the prize and gave a lecture on this topic on November 15 in Shanghai, China. • November 11, 2017. Steven Benner will present a historical overview of synthesis in chemistry based on classic work by Robert Burns Woodward, the noted 20th-century organic chemist and Nobel Laureate whose birthday centennial is being celebrated this year. Joined by Pat Confalone, who heads the American Chemical Society, and other former Woodward group members, he will discuss how synthesis as an experimental research strategy leads to discovery and paradigm change, extending to areas that Woodward did not address in his own career. This in particular includes using synthesis to create molecular systems that reproduce properties that we value in biology, but on different molecular platforms. The meeting will be held in Charlotte at the Southeast Regional Meeting of the American Chemical Society. • November 9, 2017. Prof. Benner, Distinguished Fellow at the FfAME, will give a keynote address at the Southeast Regional Meeting of the American Chemical Society in Charlotte. He will present recent work at FfAME in the area of synthetic biology. • October 20, 2017. Steven Benner will share the stage with three noted educators at the October meeting of the American Council of Trustees and Alumni (ACTA) in Washington DC. The panel will discuss the role of freedom of expression in the academy and its role in the discovery of new knowledge. His colleagues on stage include Philip Hamburger, Professor of Law at Columbia, Walter Kimbrough, President of Dilliard University, and Allison Stanger, Professor of Political Science at Middlebury. Prof. Benner has been active in this field now for 40 years. • October 19, 2017. Steven Benner, Distinguished Fellow at the FfAME, will present a seminar on synthetic biology to students at the College of Charleston in Charleston South Carolina. This is the latest in the outreach program based at FfAME which makes contact with undergraduate teaching institutions. • October 10, 2017. The entire FfAME team studying the Origins of Life will present their recent advances on the campus of the University of Colorado in Boulder. The program will culminate on Thursday, October 12 with a public presentation at the Fiske Planetarium. This presentation will combine the latest work on origins with what we know and have learned about our place in the solar system in the cosmos. This is a part of a program setting origins of life supported by the John Templeton Foundation. • October 5, 2017. Scientists at the Foundation for Applied Molecular Evolution Have Been Awarded One of Eight Nationwide Transformative Research Awards. You can read the full press release here, or read more about the NIH Director's high-risk research awards. • September 19, 2017. Steven Benner, Distinguished Fellow at the FfAME, will present recent work on DNA, RNA, the RNA World, and Origins at the RNA conference in Bordeaux, France. • September 5, 2017. Los Alamos scientists announced today the discovery of borate on Mars, as reported by phys.org. • August 21, 2017. Steven Benner, Distinguished Fellow at the FfAME, will lead a group to observe the "Great American solar eclipse". They will observe it from Saddle Mountain and Southwest Idaho. This is part of the FfAME's program introducing its international guests to extracurricular opportunities in the United States. • July 19, 2017. Steven Benner, Distinguished Fellow at the FfAME, was awarded by election as a Fellow of the International Society for the Study of the Origin of Life. • July 16, 2017. The FfAME team studying the Origins of Life will present their recent results at the biannual meeting of the International Society for the Study of the Origin of Life. The meeting will be held in San Diego. This is a part of a program setting origins of life supported by the John Templeton Foundation. • June 15, 2017. Steven Benner, Distinguished Fellow at the FfAME, will make a Plenary Presentation in Madrid Spain to the 54th Congress of the European Renal Association and the European Dialysis and Transplantation Association. The presentation will concern paleogenetics, which resurrects ancient genes and proteins from now extinct organisms, a field that Prof. Benner pioneered. Although no work at the FfAME involves renal disease, dialysis, or transplantation, the basic research at the FfAME has impact across medicine, and the invitation reflects this fact. • April 23, 2017. The FfAME will be hosting a panel of experts at AbSciCon 2017 to discuss how they combine geology with organic chemistry to understand how life might have originated here on Earth, and how it might look if encountered elsewhere. This event is open to the public with no registration required. Full details about this event can be found here. • February 24, 2017. FfAME Director Steven Benner is cited on Biotechniques.com describing the new strategy to understand how life works, not by "descriptive biology", but by building living Darwinian systems from the ground up. • February 16, 2017. The State of Florida has just gone forward with a project to develop a point-of-sampling test for the Zika, dengue, and other mosquito-borne viruses, developed and implemented at the FfAME by Ozlem Yaren, Zunyi Yang, Kevin Bradley, and Shuichi Hoshika. That test is now being shipped to India for detection of emerging pathogens. Barry Alto, from the Florida Medical Entomology Laboratory and the University of Florida, is a collaborator. More details can be found here. • February 16, 2017. A FfAME-developed test was yesterday the topic of a report on WCJB, the ABC television and news affiliate in Gainesville Florida. • February 2, 2017. The cover story of National Geographic magazine's February 2017 edition reports on the role of alcohol in human evolution, citing the paleogenetics work done at the Foundation for Applied Molecular Evolution resurrecting ancestral enzymes that digest imbibed alcohols. Using the research strategy that is the signature of the Foundation, ancestral enzymes from now extinct primates living as long ago as 80 million years were brought back to life to show that humans acquired a taste for ethanol about seven years ago, just as they were beginning to walk upright. For more, see the entire article at National Geographic. • December 14, 2016. On December 13, NASA scientists working with the Mars exploration vehicle in Gale Crater announced the discovery of borate minerals on the Red Planet. See this segment starting at 27 minutes. This discovery completes the inventory of minerals needed for life to have originated on Mars under a theory developed at the FfAME. • December 13, 2016. Research from the Foundation has been featured on the cover of Angewandte Chemie, the foremost journal in European Chemistry. The graphic, designed by Kevin Bradley, can now be viewed on their website. • December 5, 2016. Steven Benner, Distinguished Fellow at the FfAME, was interviewed this morning on National Public Radio on work at the FfAME on the search for life in the cosmos. • November 29, 2016. Research from the Foundation will be featured on the cover of Acta Crystallographica. A preview of the graphic describing a molecular structure of a component of our artificial genetic system can be found here. • November 20, 2016. Steven Benner will be speaking at 11:00 AM at the Sunday Assembly in Gainesville, 530 W. University Avenue, on the subject of the origin of life. Admission is free. • September 22, 2016. Steven Benner, Distinguished Fellow at the FfAME, will present theories on Mars as a site for the origin of life at The 19th Annual International Mars Society Convention. This is being held at the Catholic University of America in Washington, D.C. Live streaming at 1:00 PM is available here. • September 22, 2016. 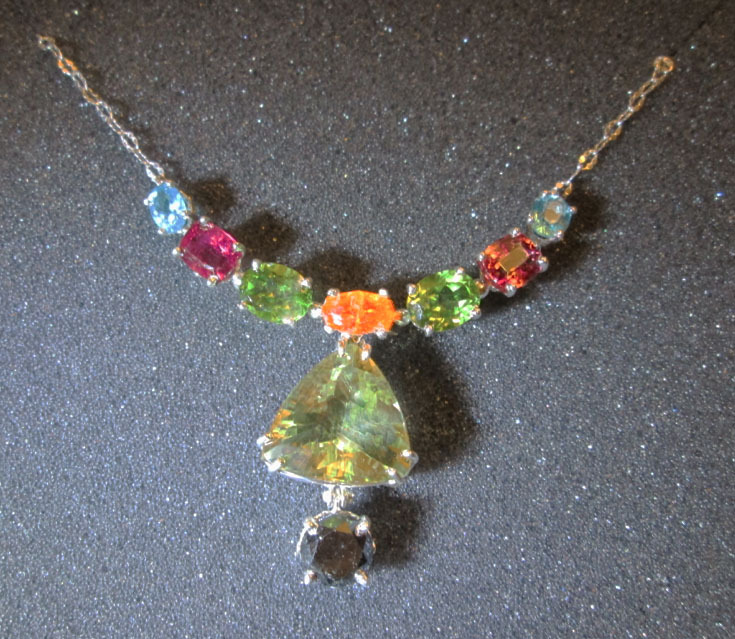 Announcing Origin of Life jewelry. Contact origins@ffame.org. • September 15, 2016. Steven Benner, Distinguished Fellow at the FfAME, joined with astrobiologists, historians of science, and science journalists, in a public forum at the Library of Congress to discussed the origin of life. Video will be available from www.loc.gov in about two weeks. • June 3, 2016. At a ceremony today, Steven Benner will be awarded an Honoris Causa honorary doctorate by the University of Medicine and Pharmacy of Craiova. His degree cites his work studying the origin of life. • May 3, 2016. The Hon. Congressman Ted Yoho is scheduled to visit the FfAME on Wednesday, May 4 at 11:00, to survey the research and development projects here. Congressman Yoho, trained as a veterinarian, was elected to represent Florida's 3rd Congressional district in 2012. • April 14, 2016. Steven Benner will present the 2016 Pasakarnis-Buchanan public lecture at Bowling Green State University in Ohio the evening of April 14, discussing work at the FfAME on paleogenetics. The event will begin at 7:00 PM in the Bowen Thompson Student Union Theater. • March 25, 2016. The Gainesville Sun, on its front page, Friday reported on the recent initiative under which the Foundation for Applied Molecular Evolution joined with the John Templeton Foundation to study the origins of life on Earth. • March 24, 2016. Steven Benner, Distinguished Fellow at the FfAME, comments on the announcement from Clyde Hutchison and his colleagues at the J. Craig Venter Institute on their synthesis of a microorganism with a very small genome. • March 17, 2016. Steven Benner will be presenting the FfAME's work in paleogenetics at Cambridge University, England, on March 18, in the Babbage Lecture Theatre. This is a one day public symposium on "Evolution of Life", and includes distinguished faculty from the University of Oxford, Georgia Tech, MIT, and the Ludwig Maximilian University in Munich, Germany. See more information here. • March 11, 2016. The Foundation for Applied Molecular Evolution joins with the John Templeton Foundation to begin a three year, $5.4 million program to understand the origins of life. See the full press release or read more on the origins of life. • December 15, 2015. In Hawaii, Elisa Biondi will describe her work with Hyo-Joong Kim to understand how life originated on Earth. The presentation will be made as part of the Asian-North American Pacific chemistry conference. • June 9, 2015. A discussion of possible life on Mars, involving Gil Levin, who designed the 1976 Mars Viking label release life detection test, a variety of Mars experts, and FfAME's Steven Benner, is now live online on Astrobiology's Fast Track. • May 29, 2015. FfAME announced in April, 2015 that the John Templeton Foundation has awarded the FfAME $5.4 million to support research to explore the origins of life on Earth. In addition to supporting work in Alachua County, the FfAME will direct an open competition from scientists worldwide to propose innovative solutions to this long standing question. Click here to read more. • May 26, 2015. Some recent work at the FfAME done by Nicole Leal, Hyo-Joong Kim, Shuichi Hoshika, and Myong-Jung Kim was featured on the April podcast of the Synthetic Biology journal of the American Chemical Society. • May 19, 2015. We are saddened to hear of the passing of Dr. John M. Templeton Jr., president and chairman of the John Templeton Foundation. His contributions to discovery and inquiry, including some at the FfAME, will be missed. • March 21, 2015. Steven Benner will join speakers who are working to expand the genetic alphabet to present FfAME's recent work. The presentation is on the morning of Monday, March 23rd, at the American Chemical Society meeting in Denver. • March 19, 2015. Steven Benner will join experts in astrobiology and religion in a Blumberg discussion at the John W. Kluge Center at the Library of Congress in Washington DC, covering the topic: "Astrobiology and the Religious Imagination: Reexamining Notions of Creation, Humanity, Selfhood, and the Cosmos" The discussion is open to the public, and will take place at 3:30 p.m. on Thursday, in room LJ-119, on the first floor of the Library's Thomas Jefferson Building, 10 First St. S.E., Washington, D.C.
• January 18, 2015. On January 24, the Florida Museum of Natural History will be hosting Sue, the famous Tyrannosaurus rex visiting Gainesville from the Field Museum in Chicago. FfAME will be there, showcasing its "Jurassic Park" research. This includes work resurrecting proteins from our primate ancestors that first allowed us to imbibe alcohol, the ancient yeast that first created alcohol on Earth, and from ancient ruminants responding to climate change. 10:00 AM - 5:00 PM. • January 12, 2015. Expertise of the staff at the FfAME concerning the origin of life was called upon last month to comment on new results, emerging from the Czech Republic, on how meteorite impact might have led to the formation of small amounts of the building blocks essential for RNA, believed to be the first genetic molecule. See the article on the Science website. • December 18, 2014. The American Association for the Advancement of Science has just announced the election of Steven A. Benner as one of its 2014 Fellows. Steven Benner is President and Distinguished Fellow at the Foundation for Applied Molecular Evolution (FfAME), a nonprofit research organization in Gainesville. In support of its awarding this prestigious honor by America's oldest scientific society, the AAAS cited Dr. Benner's pioneering work in many fields, including paleogenetics, synthetic biology, evolutionary bioinformatics, human medicine, and space exploration. Dr. Benner joins six other Fellows elected this year from the Gainesville scientific community, including Cammy Abernathy, Robert Cousins, Andrew Hanson, Ann Progulske-Fox, and Wolfgang M. Sigmund, all at the University of Florida, and Bruce McFadden, also at the Florida Museum of Natural History. • December 1, 2014. Matthew Carrigan, Steven Benner, and their colleagues at the Foundation for Applied Molecular Evolution recently resurrected proteins that oxidize alcohol in the digestive tracts of now-extinct primates dating back some 80 million years. The behaviors of these ancient proteins suggest that our primate ancestors acquired the ability to metabolize digested alcohol at the same time as they descended from the trees to walk on the ground, where they could pick up fruit that had fallen, suffered damage to its husk, and therefore became infected with fermenting yeast. The Science magazine news piece can be found here. • September 22, 2014. Japanese television described last week work being done at the Foundation for Applied Molecular Evolution on the role of minerals and their elements on the origin of life on earth, the potential for life elsewhere in the solar system. • May 4, 2014. At 7:00 PM on May 22, Steven Benner will be presenting a public lecture in Seattle (Kane Hall), on the subject: Finding Alien Life. On Earth, on Mars, and throughout the Cosmos. The event is free and open to the public. Pre-registration is encouraged to guarantee seating. Abstract: How do we define "life"? This fundamental question has remained largely philosophical, because it has been asked for so long, by so many, and with so few concrete conclusions. In this talk, Dr. Benner will take a different tack. He will show how laboratory studies to create a second example of life help us develop a firmer scientific understanding of what life is. The challenge of "synthetic biology" is on! Dr. Benner will discuss how we are hitchhiking on rockets, rovers, and telescopes to find life elsewhere in the Solar System, and will describe how his research team is working to develop that second example of life in laboratories here on Earth, one step at a time. • March 21, 2014. Steven Benner, Distinguished Fellow at the FfAME, will give the "Beyond Lecture" at Arizona State University, Neeb Hall, at 7:30 PM. Previous lecturers have included the biologist Richard Dawkins, physicist Freeman Dyson, and Nobel Laureate Frank Wilczek. Afterwards, Dr. Benner will sign copies of his book "Life, the Universe, and the Scientific Method". For more information, visit the ASU Beyond website or see Synthetic biologist to discuss creating life in the lab at ASU lecture. • January 24, 2014. FfAME scientists announced in December the joining of its artificial genetic system with Darwinian evolution. Stuart Dambrot reviews this work for the public at phys.org. • January 17, 2014. Science magazine has just reviewed recent work at the Foundation on the need for dry land as a venue for the origin of life. • November 17, 2013. Steven Benner and Bill Nye ("The Science Guy") will be presenting comments at 1:00 PM and 2:00 PM about Monday's launch of the MAVEN mission to Mars. The event will take place at the Kennedy Space Center on Sunday, November 17, and is open to the public. • October 21, 2013. Steven Benner, Distinguished Fellow at the FfAME, is a panelist on the Forum of the National Academy of Sciences covering synthetic biology. Its first US meeting is open to the public at the Academy's Keck Center, 500 Fifth St. NW, Washington DC, October 21. • September 6, 2013. On Science Friday today, Steven Benner at the FfAME and Christopher McKay discuss with Ira Flatow the possibility that early Mars was a more hospitable place for life to originate than early Earth. Live at 2:20 Eastern Daylight Time. Check National Public Radio for local listings. • August 29, 2013. Researchers from the FfAME give a talk today in Italy discussing evidence relating to the hypothesis that life in the Solar System originated first on Mars, and later came to Earth. In Florence, the talk at the Goldschmidt conference is attracting together many Earth and planetary scientists, as it discusses the interaction between minerals and organic molecules leading up to the first genetic molecules. • April 27, 2013. Research at the FfAME covering artificial genetic systems was described this week by Adam Rutherford in The Guardian of London. They note the "startling progress towards reinventing the language of life", and that for DNA, the "original four-letter alphabet is now up to at least six, with the addition of Z and P by scientists including Steve Benner at the Foundation for Applied Molecular Evolution in Florida." The Contributions of Frank Westheimer to Biological Organic Chemistry. Michael Blackburn is Professor emeritus of Sheffield University, and an expert in enzyme catalysis, phosphorus chemistry, and bioorganic chemistry, all field pioneered by Frank H. Westheimer during his productive lifetime. • February 15, 2013. Steven Benner will be describing the evolutionary history of the interaction between primates and alcohol at the Annual Meeting of the American Society for the Advancement of Science. The presentation is in the Hynes Convention Center in Boston, Friday afternoon, February 15. • December 2, 2012. A podcast at Nature magazine features Steven Benner describing expanded genetic alphabets being developed at the FfAME and at Firebird. It can be found under the title "A new alphabet". • November 21, 2012. The Thiele Foundation has selected General Genomics as one of its BreakoutLabs, GG was founded by Eric A. Gaucher, former President of the FfAME and now at Georgia Tech. Seeking to change how innovative science and technology is funded, the Thiele Foundation funds early stage companies and BreakoutLabs that will, if successful, enable radical advances and have far-reaching impact. General Genomics will use evolutionary analyses to speed the design of medically useful proteins. • November 21, 2012. Roberta Kwok of Nature has published a news feature highlighting work in synthetic biology at the FfAME. Also included is work of a former student and grand-student from the Benner laboratory (respectively, Philip Holliger, now at the MRC in Cambridge. and Ichiro Hirao, now at RIKEN in Yokohoma, Japan). • October 24, 2012. As part of FfAME's outreach activities, Steven Benner will give a lecture on the topic: "What Science is That Religion is Not and Why Scientistis Do So Very Little of It" at 7:00 PM at the Christian Study Center of Gainesville (112 NW 16th St). This is part of the Center's program on "Science and Faith: An Evolving Conversation". • September 5, 2012. Research at the FfAME was recently highlighted in a BioTechniques article. • August 7, 2012. The NASA astrobiology webpage this month features research seeking to develop "alien" genetic systems, including work done at FfAME and at Cambridge University in the laboratory of Philipp Holliger. Philipp did his Masters degree in the Benner laboratory. Congratulations Philipp. • May 1, 2012. The Sceptical Chymist this month profiled Dr. Steven Benner, Director of the Westheimer Institute at the Foundation for Applied Molecular Evolution. • April 30, 2012. New kinds of DNA were first created in the Benner laboratory 20 years ago. Today, these are used in diagnostics, medicine, and nanotechnology. The next phase in synthetic biology was published in Science last week, in a paper coauthored by Philipp Holliger, a former Benner coworker, and John Chaput, who studied with Christopher Switzer, also a former Benner coworker. Their work is covered, in the Los Angeles Times, Popular Mechanics, the Royal Society of Chemistry, and Nature magazine. • March 7, 2012. Steven Benner will be giving the Capstone Lecture at Pittcon in Orlando on March 14, 2012. Here, he will describe how innovative nucleic acid reagents can help instruments detect DNA sequences in diagnostics tools targeted against infectious diseases, inherited diseases, cancers, and geriatric diseases. • January 12, 2012. New Scholarship Announced to Honor Frank H. Westheimer. January 15, 2012 marks the 100th anniversary of the birth of Frank H. Westheimer, a founder of the field of biological chemistry. Today, scientists at The Westheimer Institute for Science and Technology (TWIST) at the Foundation for Applied Molecular Evolution (FfAME) follow his vision to apply chemistry to medicine, genomics, and biotechnology. Accordingly, in honor of Prof. Westheimer's centennial birthday, the Westheimer Institute for Science and Technology, in collaboration with the Foundation for Applied Molecular Evolution, is announcing the first year of a scholarship program to support the advanced education of children of students who have trained with TWIST and FfAME scientists. For more information, contact ljackson@ffame.org. • August 23, 2011. The Royal Society of Chemistry describes a major new advance made at the FfAME in the area of synthetic biology (see Expanded genetic alphabet could spell out new genes). This advance comes from DTRA-funded work that studies the fundamental science that stands behind the DNA double helix. • August 12, 2011. Steven Benner will join Arthur Caplan, Director of the Center for Bioethics at the University of Pennsylvania, to discuss artificial life with Patt Morrison, the Pulitzer Prize-winning journalist of the NPR affiliate KPCC in Los Angeles. The broadcast will be live on Friday, August 12, 1:30 - 2:00 PM Pacific / 4:30 - 5:00 PM Eastern, and will take listener calls. • June 17, 2011. Steven Benner gave a plenary talk at the BioBricks meeting in Palo Alto on Friday. The master of the 18 minute talk, Dr. Benner's presentation will be available online in a few weeks. In addition to outlining the current status of synthetic biology at the FfAME, his talk produced the number one tweet among conference attendees who rebroadcasted Benner's aphorism: "Culture is what you think when you are not thinking." • February 21, 2011. Steven Benner, Distinguished Fellow at the FfAME, participated with Richard Dawkins, Craig Venter, and other scientists in a workshop on the origin of life. The discussion is summarized in the New York Times by science writer Dennis Overbye in a piece titled A Romp Into Theories of the Cradle of Life. • February 18, 2011. FfAME scientists speak with MSNBC about the furor over arsenic based life, and the possibility that such molecules might support genetics in ultracold environments, such as Titan, a moon of Saturn. For more, read Definition of life: Arsenic debate just won't die. • February 8, 2011. The debate over arsenic DNA has been satirized by Scott Adams in this Dilbert comic strip. • December 2, 2010. Steven Benner will participate in a NASA news conference to discuss a new finding in astrobiology that will aid in the search for extraterrestrial life. The conference will occur on Thursday, December 2 (14:00 EST) at NASA Headquarters. To attend the conference or watch it streamed live online, please view NASA media advisory M10-167. • November 9, 2010. Steven Benner will present an 18 minute talk as part of the National Academy's program "Sharing the Adventure with the Public", which communicates to the public the value and excitement of 'Grand Questions' in space science and exploration. The program will be held November 8-10 at the Beckman Center on the campus of the University of California, Irvine. Click here for more information. • November 8, 2010. Dr. Steven Benner will speak on Monday, November 8 (15:45-16:15, EST) at a NASA online "Workshop Without Walls" on Molecular Paleontology and Resurrection. The workshop has already gone viral, and will attract an audience from Tanzania to Iran to Oklahoma. Dr. Benner is the inventor of paleogenetics, where genes and proteins from ancient organisms are resurrected in laboratory studies important to science and medicine. Click here for more information. • October 14, 2010. In a symposium celebrating 50 years of Astrobiology at NASA, Steven Benner will be presenting a popular lecture on "Extraterrestrial Life. How and Where to Look". A master of "the 18 minute talk" and author of the book "Life, the Universe and the Scientific Method", Prof. Benner will discuss with a panel of experts current ideas about life on Titan, a moon of Saturn, and other exotic locales in the Solar System. The symposium is all day Thursday, October 14, at the Lockheed Martin Theater in Crystal City, Arlington, VA.
• August 30, 2010. In Science magazine this week, FfAME scientists analyze the potential roles of silicate, aluminate, and borate minerals in the origin of life. • May 20, 2010. Nature magazine has featured a commentary by FfAME scientists on the synthesis of an entire bacterial genome in the J. Craig Venter Institute. This synthesis is the next step in the whole gene synthesis paradigm that began in the Benner laboratory in 1984. See Life after the synthetic cell for a full set of comments. • April 29, 2010. On Thursday, April 29, Matthew Carrigan, Fellow at the FfAME, will present recent advances on the use of paleogenetics to understand human behavior as it relates to alcoholism and alcohol abuse. He will be speaking at the Astrobiology Science Conference in Houston, Texas. • April 26, 2010. Steven Benner, Distinguished Fellow at the FfAME, and Robert Shapiro, Professor at New York University, squared off yesterday at the Astrobiology Science Conference in Houston, over the role of RNA in the origin of life. The debate, moderated by Nick Hud from Georgia Tech, went for 90 minutes, including audience contributions. • April 2, 2010. 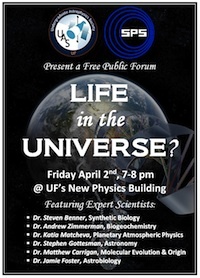 On Friday, April 2, in the New Physics Building at the University of Florida, Matthew Carrigan and Steven Benner will join distinguished astrobiologists from UF and NASA, as well as physicists and astronomers interested galaxies, stars, and planets, to discuss "origins", of life, the universe, and everything. The panel discussion, open to the public and taking questions from the floor, will begin at 7:00 PM. • November 6, 2009. FfAME scientists are featured tonight on Bloomberg News as part of their "Innovators" program. Airing times are Fri: 9:00pm, 11:00pm; Sat: 3:00pm, 6:00pm, 8:00pm, 10:00pm; Sun: 12:00am 10:00am, 1:00pm, 4:00pm. The episode will also appear this evening on the Bloomberg Innovators webpage. • November 6, 2009. Prof. Steven Benner will participate in a Pontifical Academy Study week on Astrobiology at the Vatican in Italy. He will be presenting a talk entitled: "Towards a Theory of Life." • October 20, 2009. Prof. Steven Benner will be giving a public lecture on "Life, the Universe and the Scientific Method" in Seattle, WA. The lecture is sponsored by the Astrobiology program at the University of Washington. He will also be signing books on campus. • October 9, 2009. Bloomberg News, as part of its "Innovators" series, has interviewed scientists at the FfAME, for viewing later this month. • October 7, 2009. Prof. Steven Benner will be giving a talk on "The Role of Planet Earth in Life's Origins" at Harvard University Biological Laboratories (Lecture Hall, 16 Divinity Avenue, Room 1068). He will also be signing books in Cambridge, MA on October 6. 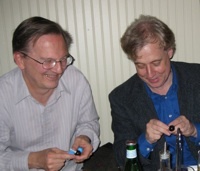 Steven Benner (right), Distinguished Fellow at the FfAME, discussing molecular structure with Jack Szostak at dinner just after the Prize was announced. • October 5, 2009. Jack Szostak wins the Nobel Prize in Physiology for Medicine. Prof. Szostak at the Massachusetts General Hospital is a long time collaborator of scientists at the FfAME, most recently in a project funded by the National Science Foundation under its Chemical Bonding program. • April 6, 2009. Paleogenetics: A Quarter Century Old. The spring of 2009 marks the 25th anniversary of the first paper taking steps to resurrect ancient genes and proteins from extinct organisms to test historical hypotheses and join natural history to the physical sciences. These first steps in the laboratory of Steven Benner, then at Harvard but now at the FfAME, opened the new field of experimental paleogenetics. Today, over two dozen paleogenetics studies have helped us understand how humans adapted to alcohol, dinosaurs saw colors, and bacterial life originated. • March 23, 2009. Twenty Five Years of Synthetic Biology. Today marks the 25th anniversary of the publication of a paper reporting the first total synthesis of a gene encoding an enzyme. The gene was made in the Benner group by Krishnan Nambiar, Joseph Stackhouse, Dora Stauffer and John Eldredge. Today, the chemical synthesis of a gene is routine, using the strategy described in this pioneering work. • February 25, 2009. Scientists at the Foundation discuss recent research on synthetic biology, DNA, and medicine. Watch the video. • February 15, 2009. FfAME scientists announce an artificial chemical system capable of Darwinian evolution. Read the press release. • February 12, 2009. Happy 200th Birthday, Charles Darwin! • January 1, 2009. In the new year, the FfAME will be distributing copies of the new book by Dr. Steven Benner titled: Life, the Universe, and the Scientific Method for an introductory price of $34.95 plus shipping and handling. For information, please contact Romaine Hughes. • December 31, 2008. The year 2009 marks the 200th anniversary of the birth of Charles Darwin. FfAME scientists will participate in festive and scientific events around the world to mark this anniversary, including the Darwin Day hosted by the National Evolutionary Synthesis Center in Durham, North Carolina on February 21, the Molecular Evolution Conference at McMaster University in Canada, May 25-29, and the "Evolving Evolution" symposium at Harvard, October 8 and 9. • December 16, 2008. The American Geophysical Union will feature a special session on the chemical elements in biology. Work of FfAME scientists, including H. J. Kim, will discuss two of these, boron and molybdenum, and their role in models for the origin of life on Earth. • June 1, 2008. Steven Benner, Distinguished Fellow at the FfAME, will join the discussion on the "Universal Laws of Life" in the World Science Festival on June 1 in New York City. This week long program includes actor Alan Alda and PBS's Brian Greene, and will make many of the most exciting themes in science accessible to the public. • April 25, 2008. Steven Benner, Distinguished Fellow at the FfAME, gave a plenary lecture at the Astrobiology Science Conference in Santa Clara last week, on the origin of life and the possibility of alien life in environments quite different from Earth. See commentary. • February 7, 2008. FfAME scientists, in collaboration with the University of Florida and DNA2.0, have concluded that 3.5 billion years ago life lived in a hot environment of 165° F (75° C), and gradually cooled to 100° F (40° C) by 500 million years ago. The study, published today in Nature, reconstructed ancient bacterial genes that serve as ancient thermometers. The findings are nearly identical to geological studies that estimate ancient ocean temperatures over the same time period. • January 23, 2008. Dr. Steven Benner, Distinguished Fellow at the FfAME, will speak on the "Scientific Method" in a public lecture sponsored by the National Academy of Sciences. The lecture will be at 8:00 in the evening at the Beckman Center on the campus of the University of California at Irvine. • January 7, 2008. FfAME scientists will make a multi-media presentation to residents of Oak Hammock at the University of Florida. Starting at 1:30 PM, the presentation is entitled: "The Origin of Life". • December 1, 2007. Dr. Steven Benner, Distinguished Fellow at the FfAME, will participate in the Space Science Symposium, Beckman Center, Irvine CA. This is one of the monthly events celebrating the second International Geophysical Year, on the 50th anniversary of the first IGY in 1957. The launch of Sputnik was the most the notable event of the IGY, and began the space age. • October 4, 2007. Dr. Steven Benner, Distinguished Fellow at the FfAME, will join three other panelists in a debate, open to the public, about the origin of life. The venue will be the third annual Lorne Trottier Public Science Symposium, held at McGill University in Montreal in the evening of October 4. The other panelists are Antonio Lazcano, noted expert on origins from the University of Mexico City, Robert Shapiro, author and professor emeritus at NYU, and Stuart Kauffman, mathematician and professor at the University of Calgary. Christopher McKay, astrobiologist and planetary explorer, will moderate. Work on the origins of life ongoing at the FfAME has been funded by the Astrobiology program at NASA. Click here for a primer on the debate topics. • September 4, 2007. Listeners of Earth & Sky will have the opportunity to hear two reports from Foundation scientists this month. The first concerns the nature of alien life. The second concerns the emerging field of synthetic biology, which FfAME scientists pioneered and which is a major research focus of the Foundation. • August 30, 2007. Dr. Steven Benner, distinguished fellow at the Foundation, gives a plenary lecture at the 10th International Mars Society Convention at 1pm on the campus of University of California at Los Angeles. He will speak of the potential for life on Mars and elsewhere in the solar system. • August 20, 2007. The Associated Press and Seth Borenstein reported today on the work on synthetic biology at the Foundation. Synthetic genetic systems developed by Foundation scientists already improve the health care of some 400,000 patients, and work in progress cited by the Associated Press promises to expand that impact in the future. • July 6, 2007. FfAME scientist coauthored a report from the National Academy of Sciences describing forms of unusual extraterrestrial life. Click here to read the full report online. The New York Times reports in a piece titled Expanded Search for Extraterrestrial Life Urged. • December 18, 2006. Foundation scientists supported by the Templeton Foundation will be participating in a symposium in Tempe to decide whether we have missed detecting a form of life on Earth quite different from the life here that we know about. • November 15, 2006. A paper from Foundation scientists was the second most downloaded paper from the Proceedings of the National Academy of Sciences in October. See: Benner, Devine, Matveeva & Powell (2000) The missing organic molecules on Mars. Proc. Nat. Acad. Sci. 97, 2425. This work was supported by NASA through its Exobiology program. • November 3, 2006. German television will be filming an episode of Quarks on the FfAME campus. Quarks is similar to the NOVA program from WGBH. This episode will focus on the use of artificial DNA in human diagnostics and systems biology research, and the likelihood of unusual genetic systems in alien life. • October 27, 2006. Geological research published this week in Nature concluded that oceans 3 billion years ago were 150° F (65° C). At this time, common bacteria were first emerging, and must have been adapted to these high temperatures. This remarkable conclusion was predicted three years ago by Foundation scientists through their analysis of bacterial genomes, and the resurrection of ancient proteins from extinct ancestral bacteria. The Foundation work was featured last year in the Wall Street Journal. • October 24, 2006. With their collaborators from the Harvard Medical School and the Scripps Research Institute, Foundation scientists hosted a site visit of distinguished scientists in La Jolla to present their progress to create artificial Darwinian chemical systems as part of a Foundation-Harvard-Scripps Center for Chemical Bonding supported by the National Science Foundation. • October 23, 2006. Christopher McKay and his colleagues at NASA Ames confirmed a prediction made by FfAME scientists in 2000, that the Viking 1976 Mars lander could have overlooked considerable amounts of organic material on the surface of Mars (Navaro-Gonzales et al. (2006) Proc. Natl. Acad. Sci. 103, 16089; Benner et al. (2000) Proc. Natl. Acad. Sci, 97, 2425 see also Wall Street Journal Tuesday, October 24, p B1). • October 9, 2006. Dr. Eric Gaucher will describe advances in 'Evolutionary Synthetic Biology' to the Chemistry Dept. at the Scripps Research Institute in La Jolla, CA. and the Botany Dept. at the University of Florida. This work exploits evolutionary models in attempts to design synthetic DNA polymerases that accept modified DNA bases. See their listings for time and location. • October 8, 2006. Steven Benner, Distinguished Fellow at the Foundation for Applied Molecular Evolution, will be this week's guest of Mat Kaplan, host of the radio show "Planetary Radio", produced by the Planetary Society. Covering the possibilities of extracellular life, the interview can be heard locally on Radio NHCWX 11:00-11:30 PM, Friday October 13. Other listings throughout the week can be found by clicking here. • October 4, 2006. Foundation scientists announced their participation in the Archon X PRIZE for Genomics competition to sequence 100 human genomes in 10 days for a cost of less than $10,000 per genome. The announcement was made at a gala celebration in Washington DC attended by Foundation representatives, several Nobel laureates, and Dr. J. Craig Venter, the first human to have his genome sequenced. • July 28, 2006. FfAME scientists present new data describing the chemistry behind the origin of life at the Gordon Conference at Bates College in July. In a major breakthrough, FfAME scientists have provided a series of chemical steps that move simple organic molecules all of the way to the first genetic molecules. • July 13, 2006. The FfAME announces the opening of The Westheimer Institute for Science and Technology. TWIST brings together molecular science, natural history, chemistry and medicine to provide a unique polydisciplinary education and training program for graduate students and postdoctoral associates. Download brochure (3.5MB). • June 15, 2006. FfAME scientists present new data on human diagnostics at the Gordon Conference on Stereochemistry in June. These advances include tools that detect small RNA molecules in complex biological tissues, key to understanding biology and disease, including human cancer. Steven Benner, Distinguished Fellow at the Foundation for Applied Molecular Evolution, and a Co-Investigator in the NSF Chemical Bonding Center, took the stage at the 2006 conference at the Astrobiology National Meeting in Washington DC to engage in the "Great Debate: Does life exist in the cosmos in a form different from the life we know on Earth?" Joining him was Peter Ward, from the University of Washington, and author of the new book: "Life as We Do Not Know It" and a panel of distinguished chemical and evolutionary biologists. The Great Debate took place on March 29, from 7:00 PM to 9:00 PM in the amphitheater of the Ronald Reagan Building and International Trade Center. It was covered by NASA television. • March 1, 2006. The FfAME announces a new grant from the NIH to develop more efficient combinatorial libraries in collaboration with DNA 2.0. • December 9, 2005. The Emory University Conference Center recently hosted a symposium "Pioneering Research for 50 Years", for former Benner coworkers in Atlanta on December 9-11, 2005 to highlight a half century of pioneering research. • February 20, 2005. FfAME scientists, as part of the Foundation's outrearch program, presented a seminar at the Florida Museum of Natural History on the origin on life and the chemistry that might support metabolism in alien life.